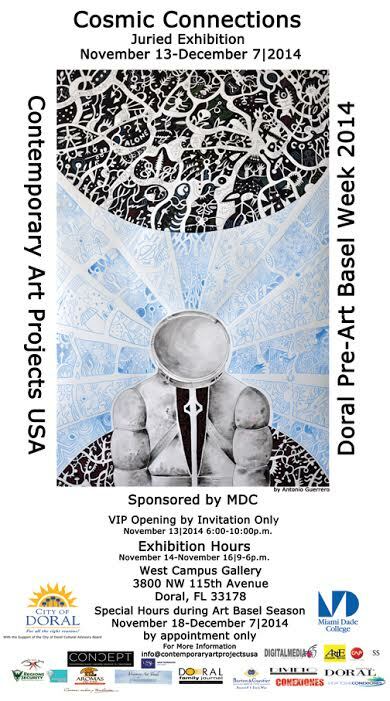 This award winner poster by Antonio Guerrero was chosen to represent Cosmic Connections Exhibition by Contemporary Art Projects USA at the American Largest College Miami Dade West Campus, Doral, Florida. Antonio Guerrero’s interdisciplinary work, which encompasses painting, sculpture, writing and photography is shaped by a wide array of interests including the philosophy of consciousness, Cuban culture and human cognition, which refers to the mental processes involved in establishing and shaping our understanding of reality. 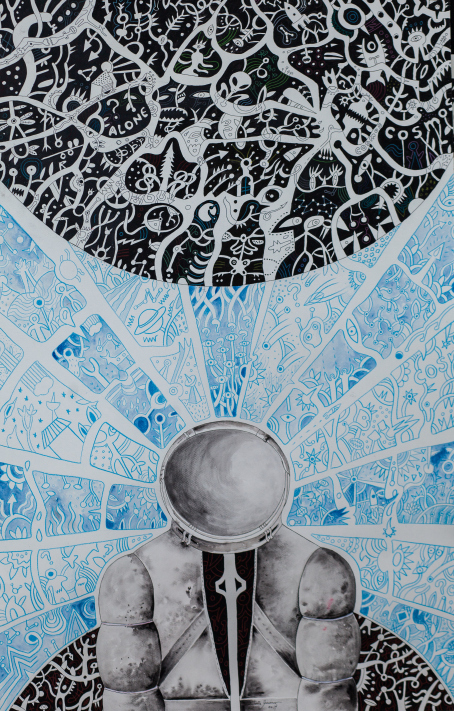 His work explores philosophical questions like the nature of existence, mind and body, knowledge, goodness and beauty. His interest in knowledge extends from the avant-garde arts and philosophy to history, literature, social sciences, public policy and economics. Of special interest are the forces driving social and cultural change such as globalization and the avant-garde artistic movements. Miami Dade College is the largest and most diverse college in the nation. With seven campuses, two centers and more than 165,000 students from across the world, the College offers over 300 programs of study and several degree options, including vocational, associate, and baccalaureate degrees. MDC features numerous Continuing Education classes, online credit classes through the Virtual College, the New World School of the Arts, the School for Advanced Studies, The Honors College and Dual Enrollment.